A few weeks ago I created a strip board version of the Art Harrison Cacophonator. 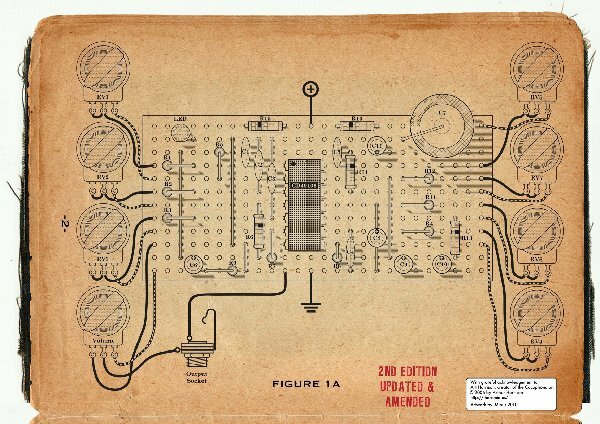 I have posted the diagrams so others may build this amazing device and enter the exciting field of Cacophony Oscillation! Many thanks to Art for his correspondence and consent to posting these images. EDIT: These images below are the corrected ones. The incorrect ones have been removed. thanks for the share man. I've got a spare 40106 here and some stripboard so i might aswell give this a go. Cheers. That looks fantastic, many compliments! Thanks for the compliments! It means a lot to me. I had so much fun doing this too. Krunkus has taught me well, but I am not a Strip Board Jedi yet! hahaha, "Strip Board Jedi" - that's funny minus. As I mentioned to you in the chatroom, I really like your artistry in creating that old paper look in Adobe Illustrator. You have real talent, or so it appears. The look of the documentation you created is really compelling. Well done. 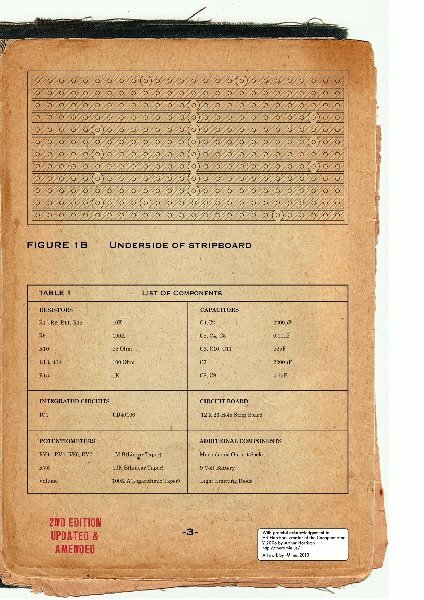 As far as compacting a stripboard in a way which lends itself perfectly to being illustrated in an aesthetically superior way,.......... I would say "Built your lightsaber you have!" May the force be with you, always! Well, it's nice to be able to contribute to this forum in whatever way we can. Think about where we would be if it wasn't for E-M? We'd all be hermits living on a desert planet...or moisture farmers. Thanks Les! Be great if a few others built this. The world could do with a bit more of this sort of noise! Just thought I should post an update in case anyone builds this thing! I had wiring issues on my colour change LED I used and had to replace it. In the process I tried the Cacophonator without the LED and noticed a HUGE difference in the time it takes for the large capacitor to discharge once the machine is turned off! Really? C7 is pretty huge at 2200uF! Not sure what I'd up it to? ....oh, wait a minute... This isn't some kind of electrical engineers joke you play on your apprentice is it? You know.... the left handed screwdriver, or the tin of checkered paint. Ha ha! I think upping the resistor might be what I'll try first! Sorry, I didn't notice it was so big to start with. Yeah, you can up the resistor so the cap discharges slower when the power is disconnected. The LED will be dimmer, but it's just to indicate power on, not for a light show. Still, I spose getting rid of it completely would be a simpler option. That's ok uncle krunkus! Good to see you are still around! I may be wrong, but shouldn't C4 connect to pin 9 (Input of osc4) rather than pin 10? And I think there' s a strip break missing in the 3rd row down - as it is, R14/C11 are linked to the +ve end of C6. I was going to ask if the layout is verified. Because I built one, and it does not make any sound. anyone here had a successful build with this layout? got home tonight, triple checked the cuts, parts and layout. fired her up again. led went on aaand SMOKE! it is not cap, but it was a resistor that smoked. R10 is starting to smoke, just seconds after I apply current to the circuit. just change the resistor and try again? Sorry its not working for you blue_lu! I built it and can verify that it does work. I'm away from home for a couple more days but will open up my box when I get home and double check the drawings with the build. If I find any mistakes in the drawings I shall correct them and let you know! In the meantime if you have had any luck in finding a fault, let us know. Yes, judging by Art's schematic, it does indeed look like I have made a mistake! C4 should go to pin 9!!!! Can't believe I missed this! Oh well, I shall fix this as soon as I get home on thursday. And... the other things.... let me see.... yes. I think this may be wrong too! I shall have an URGENT and FINE TOOTHED COMB look over this as soon as I get home on thursday!!!!!! Thanks for pointing this out Peter! I have not been near the net for a while and missed the comments recently. I shall fix this up very soon. Firstly, I'm very sorry but there appears to be two mistakes in the Cacophonator drawings I posted! This looks to be right to me. If you make a further cut in the stripboard on the third row down, just above the seven cuts under the IC, this should sort this problem out. And if you move the position of C4 so the capacitor connects to PIN 9 of the IC (next pin down from shown at present), I think your Cacophonator should work. Once again, I'm very sorry to have misled you! And apologize for the circuit board fires caused. When I return home in about 24 hours, I shall double check this and correct the drawings. Just stepped in the door.... opened up the Cacophonator and the above comment about the cap and the extra cut above the IC is indeed correct. Hope your finger gets better soon so you can get your Cacophonator working! I believe the sonic frequencies are capable of demolishing small stone structures, increasing crop yields and animal fertility, raising the dead, and perhaps mending broken bones.... but don't hold me to it. There may be another mistake in the drawing and none of the above may be possible. making mistakes is human, don't sweat it, you did an amazing job there! Maybe you could upload a soundsample so people get to listen before they build, always works for me . p.s. : Maybe you should have a peek in the lunettaforum, plenty more uses there to create mind expanding, boneshattering and even nice sounds with a 40106! 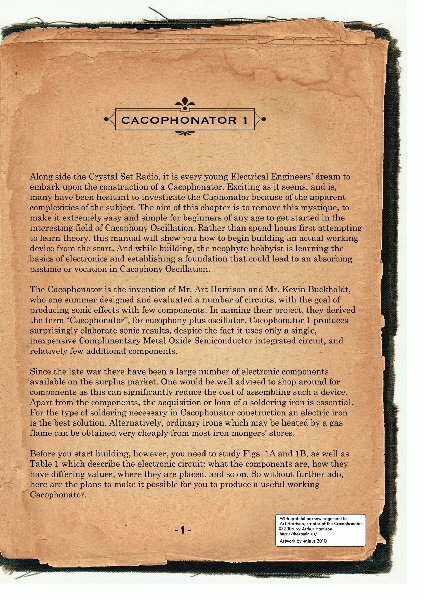 Here's some sound bites of the Cacophonator... a bit of reverb and delay added! All samples based upon the works of World renowned Science Fiction author, Arthur O'Skeely.